4. The city has issued a cease-and-desist order against the Grocery Outlet at MLK Jr. Way S. and S. Rainier Ave. for illegally operating a park-and-ride for light rail users. According to the order, issued by the Department of Planning and Development in September, park-and-rides are illegal in areas near rail stations. The violation carries a fine of up to $500 per day. I’m hardly a tool of the auto-and-pavement lobby but this is insane. The reason to oppose park and rides is that they cost a lot of public money ($40k a space in some cases) for a not a lot of riders, and because they take up valuable space that could be used for more vibrant development. In some cases, people who park might otherwise have walked, taken the bus, or biked to the station. Here we have private lots that aren’t costing a dime of tax money, and are in fact generating parking tax revenue; an abundance of empty gravel pits around all Rainier Valley stations, so that there’s no shortage of TOD locations; and of course, a small parking fee to limit users to those who have really bad bus transfers, live too far to walk, and are strongly disinclined to bike. It’s a perfect situation. My anecdotal experience, unfortunately, has been that the lots haven’t been all that well used, probably mostly because of the media-wide message that there’s no parking around light rail stations. This must get fixed immediately: the cease-and-desist lifted, any fines refunded with interest, and the policy changed. We should be helping these lots get the word out, not shutting them down. I have an email in to the Mayor’s office on what his position is on all this. Thanks for following up on this, Martin. Going after private Park and Rides is crazy. Wasn’t this store actually forced to close when construction of the MLK/Rainier station drove all of its business away? Yes, it went under because it was too hard to see and access due to station construction and staging. Hard to fault the property owners for attempting to mitigate their loss then. Maybe the Philly Steak place could move into the old grocery and go HUGE? It’s also unconstitutional harassment and 2nd degree extortion. Relevant tangent here on the subject of station area redevelopment. I’m a critic of recent Station area planning efforts, but if it is privately done, and on property already zoned for high density, great. But using public money to build subsidized housing on successful single family neighborhoods is every bit as insane as this policy, and worse. I’m also for “one-for-one replacement” of affordable units. We get called “elitists” by some overzealous housing advocates for not dropping what we’re doing to work on their favorite issue. I voted for Rev. David Bloom against Sally Bagshaw, in spite of his whacko anti-transit views. He had somehow started to believe his own rhetoric about transit activists being “elitist” and in bed with developers. While the anti-densification views of people like Bloom are laughably unsupportable, we can still make common cause here by making one-for-one (or even two-for-one) replacement of affordable housing units a piece of density legislation, and give current owners and tenants around stations some sort of security that they will continue to have a place to live. It’s not even social engineering. There no discernible benefits of this policy, regardless of what kind of city you’re trying to build. Not to mention likely totally illegal, if not an actual felony. Sorry, but the city has every right under the law to regulate land use including what sort of business activities are allowed on a paticular property. Yes, the city has every right to be as mouth-breathingly idiotic, stupid, and shortsighted as it wants. And the press has the right to report on it, and the people have the right to find out who is responsible and make sure that they are FIRED. Isn’t the worry though that if the area becomes too attractive for drivers then instead of the wonderful TOD we’re all hoping for, we will get the small, underutilized buildings demolished for parking lots. I can think of a lot of places along Rainer and MLK where property owners might think that a parking lot is less hassle than a run down building. Don’t forget that this did in fact happen in Pioneer Square in the 70’s. Lots of drivers along with difficult properties to maintain meant that the market solution was to demolish historic structures and put up parking garages or just a surface lot. I’m pretty sure that ANY parking lot in Pioneer square today was once a building. And that neighborhood of course is still struggling to make it (albeit not just from the parking situation). If we can’t get people to build things around the stations over the next few decades then I’ll be ready to say the Rainier Valley segment was a failure. If people are going to build things, that implies that building space is clearing at a decent price. If we’re in a long-term situation where leasing can’t compete with not-that-expensive parking, we might as well throw in the towel and go with a BART-like P&R orientation. Yes but if a developer is scouting out a potential development site and right next door a landowner decided to set up a P&R, the value of the potential site just dropped dramatically and the developer pulls out (or decides that he or she might as well do a P&R also). TOD will breed TOD but we haven’t had enough construction to really set the tone for future development. So in order to make it very clear that we want this to become a dense neighborhood and not a P&R for the South end of the Lake. The city needs to be very careful in how the neighborhood grows in these early years. I agree it might take some time but as this blog has consistently pointed out, Link is a long term investment and we can’t make bad decisions simply for quick ridership increases. The Grocery Outlet site is unoccupied and has been for months. Is a lot full (or, uh, partially full) of parked cars seriously worse than an empty lot, or a chain link fence with gravel inside of it? Those are the alternatives to allowing a business to operate there. My guess is the lot in question grosses perhaps $40 a day. That is not an impediment to development. This rule might make sense in places like Capitol Hill where major construction projects are still going on everywhere. But not in the Rainier Valley. Granted. Its small and understandably seems like a bad rule right now. But the only reason that site is empty in the first place is because development on it has stalled (or is it still pushing through the permitting process, I know its difficult in the Historic District). The problem is, if they leave it as a lot, and as you suggest start to publicize it. Soon, maybe they are bringing in $400/day. Not much, but enough that they are satisfied with waiting on the new mixed-use development. Then let’s say demand gets high enough to bring $1000 per day. Perhaps they don’t have the capital for the mixed-use project but they do have enough to demolish the old Grocery Outlet and build some structured parking. Well, they do that and soon they bringing in a hefty income. Well, now instead of people and shops, you have cars…and more cars. I’m not trying to argue for absolutely no P&R at all. I understand we are a spread out city and most people can’t directly get to Link. But those P&Rs need to be seriously regulated and we need to encourage smart growth by all means possible. The SODO site does seem like a reasonable place for a P&R and I’m sure that an exception can be worked out. But I would much rather have a few exceptions than general free-for-all for P&Rs. That sums it up pretty well. If you allow/encourage long term parking around the Link stations you establish a commute pattern. A glut of cars during the AM/PM rush hour combined with empty cars sitting around all day really does have a negative effect. Worse than chain link and barbed wire probably not but by enforcing the four hour rule you get traffic that is at least partially going to support local business. If the established highest value use of the land becomes a P&R then it raises the barrier to entry for locally oriented businesses to buy or lease and simultaneously makes it a less desirable market. None of the stations were built along major connecting arterials with the intent of intercepting commute traffic. Instead, long term parking here diverts traffic headed for downtown with the lure of cheap parking. You essentially create a SeaTac/Aurora strip at the expense of the neighbors who have already had to deal with the construction impact and the noise of light rail. Not exactly the vision that was promised. Yes there is perhaps room for compromise or time limited exceptions. A clause could be added to the law allowing a certain density of HOV carpool parking for example or parking with a neighborhood windshield permit. Both of these could be used to fund and study improved feeder routes and establish ideal parking ratios for future development. Again, look to the UW as an example. They hard limited the number of parking spaces back in the 80’s and have found ways to meet demand for increased trips into the U district by 50%. If you “lead with parking” you only end up with a bigger mess to solve down the road. There’s no way demand will spiral upwards to an arbitrarily high point. The lots aren’t that large and there they can’t charge any more than what they’re getting downtown minus the cost of a round-trip fare. Anyway this is a problem we can solve when it occurs. As of now there is way too much no-use property in this corridor to worry about land that is used suboptimally. If the long-term “established highest use” of the land turns out to be parking than the Rainier Valley segment is a failure. If the presence of Link isn’t enough to boost residential and commercial activity we should have put the damn thing in the freeway. Take the long view on this – say we have a successful P&R built at Rainier Beach, which may or may not help to spur TOD in that area. That lot will certainly get used by Renton and Skyway residents, as well as knowledgeable south end I-5 users. Okay, so folks are driving their car to the light rail, an intensive capital expenditure. The originations of those users could be used to plan additional capital investments wisely. ..Perhaps a branch line to Renton via Skyway and/or SouthCenter (a major sales tax revenue generator for Tukwila, a very tax rich City) makes sense based on that park and ride usage. Now, do you think those same folks are going to drive to Rainier Beach to get on the line when a stop is only a mile from their homes? The critical question in my mind is how you fit BRT into that planning mix. Personally, I would’ve liked to see the MLK line be BRT compatible, like the DSTT – but the center platforms does make that tougher. Would it be possible to retrofit? I won’t disagree that a P&R lot at Rainier Beach might make a certain amount of sense, though given the location I’d like to see it be a pay lot even if it is publicly owned. As for service to Renton and Southcenter Sound Transit has already done studies on a Burien to Renton line via Tukwila International Blvd Station, Southcenter, Tukwila Sounder/Amtrak Station, Renton TC, and North Renton. I fully expect this line to be part of the next expansion phase past ST2. Metro is already planning a RapidRide line along this corridor so there is at least some BRT. Perhaps in the future there will be one or more BRT lines connecting to Rainier Beach Station as well. I’m not aware of a single LRT line where a portion has been converted to allow joint bus/rail operations. I seriously doubt we’ll see this happen. As for those who want to see the rail line shut down and scrapped, forget it, ain’t gonna happen. Josh, the city won’t issue a permit to demolish a building for a parking lot. No, the City will just allow use as a parking lot after a building is demolished. How many times have we seen that happen? Actually they don’t anymore. The owner of the lot that used to have Kincora, Manray, Bimbo’s, the Cha Cha, and the Bus Stop on it tried to make it a parking lot after their financing fell through. The city said “no way” so now it just sits empty. As annoying as this outcome may be it is necessary to prevent buildings from being pulled down for parking lots. A 10 minute light rail ride into downtown will itself be a marketable benefit of the properties for future development. For now, let them be private park, pay, and rides. Whatevs. It’s not really “whatevs” when our electeds already determined that there was a need here. And I tend to agree. If a parking lot is pulling in a thousand dollars a day just sitting there, suddenly that parking lot costs more when we’re trying to sell it for a good use. And then the people supporting those good uses can’t support as many of them. I don’t see anyone calling for allowing construction of new parking around stations on this blog. I see people calling for allowing already-existing parking to continue to be used as such for the time being. Giving parking lot owners some warning about changes in land use policy and enforcement, and giving them time and an expedited permitting process for building replacement non-parking structures, would be the civilized thing to do. The Nickles administration was notorious for dragging out the permitting process for small businesses. My favorite Thai restaurant in Lake City moved across the street, was ready to open for business, and was held up by city bureaucracy for over a year! Eventually, that family Thai restaurant went out of business, despite a large neighborhood following. When it comes to stupidity like this, I hope the McGinn administration really is the new sheriff in town. Soon the marketplace will dictate that development be built on this site rather than parking. Let the marketplace decide this, not the city. What? The city can go after park and rides but not criminals in South Seattle…. Josh Mahar–you make a good point, but it seems the city could draw a line allowing parking on existing lots without allowing teardowns for new parking. This does ultimately makes sense. I did a double-take when I first read it as well, but JoshMahar has it right. No, it doesn’t. The city won’t issue permits for tearing buildings down for parking. There’s a huge hole in the leap of logic you’re using there. I understand your confusion as to why we removed the ten hour parking option. The reason is that there has been a city zoning change that does not allow long term (more then four hours) parking near the Light Rail. Four hours is worthless. That’s not long enough to take the train downtown for a meal, a movie or some shopping. “Evenings after 5PM $6.00”. I don’t know how long it takes you to eat but it doesn’t even matter as long as it’s outside the 9-5 day. The point is to try and create demand for shopping in the neighborhoods around the RV stations; not to subsidizes parking for upscale businesses downtown at the expense of those neighborhoods. That picture is not of the actual lot. The lot is $4 for 4 hours, and used to be $4/day. After 5pm, the RPZ is not in effect so you can park on neighborhood streets with impunity. I do patronize local business, but the Mt. Baker station doesn’t have a lot to offer. If I need some tires I’m going to go by car. Ditto for nearly anything I would buy at Lowe’s. That leaves a handful of restaurants and QFC. Not really much of a local shopping experience or destination – it’s mostly chains and some cheap food. I *do* patronize the shops arount Mt. Baker station. More than I ever would have before. I do this *because* I can now park near the station and ride it into downtown. Before I head downtown, I patronize the shops. After I return, I patronize the shops. I live 2 miles from the station and otherwise wouldn’t go there. My bus ends 1 mile from the station, so I HAVE TO DRIVE TO IT. My bus only goes downtown every half hour and it’s awful! Your utopian vision is out of touch with reality. Doesn’t it strike you as just wrong that someone living in Seattle within two miles of a light rail station has no option but to drive a car? This sounds like a system failure and I don’t see why more parking should be the “fix” for a $2 billion dollar light rail line that isn’t meeting ridership numbers. Blog principles have made a big deal out of how we shouldn’t focus too much on initial ridership numbers and they’re right. Look at it yes because that’s how you learn but long term trends are what matter. As Martin has said, if Link can’t generate the demand then the routing choice was a failure. Maybe it was, maybe not. I tend to believe that given time (~15 years) it will work out just fine. But sabotaging that with an incentive to develop a “right to parking” will not further than goal. My observation walking the line around Othello Station over Xmas was… this is nice, lots of new building… now; who wants to live here? Mike, you’re part of the neighborhood. Do you really want to establish the precedent that this is a place to park, arm your car alarm and ride downtown? I doubt it. Mike, what bus is that? I feel like I’ve asked this before. Where are you coming from? Mike – I guess you’re talking about the 27. Is that right? The 27 should be extended to Mt. Baker station, but that would require an additional bus on the route. There are some really interesting tradeoffs in running buses to serve the station. For one thing, no one really wants to give up their one seat ride downtown because at that range it never pays to transfer. If you’re already on a bus your “rail bias” clearly isn’t high enough to make a difference. I want to post on this a couple of weeks when I have the chance. But it only runs every 1/2 hour anyhow. This is stupid because it means the USPS is less likely to find a private buyer for their SODO garage right next to SODO station. Since the garage is already built it makes sense for it to be used as a P&R and remote pay lot for downtown and the stadiums with a convenient connection. As for the concerns about seeing buildings torn down for parking lots, lets address that concern directly. Frankly I think private pay lots are a great market-driven solution to the issue of accessing light rail. Isn’t the issue simply that the lots are unlicensed? The city goes after unlicensed bars, restaurants and hair salons all the time. Don’t licensed parking lots in the city have to pay special taxes? If the city doesn’t want a black market in unlicensed parking lots, that seems reasonable to me. 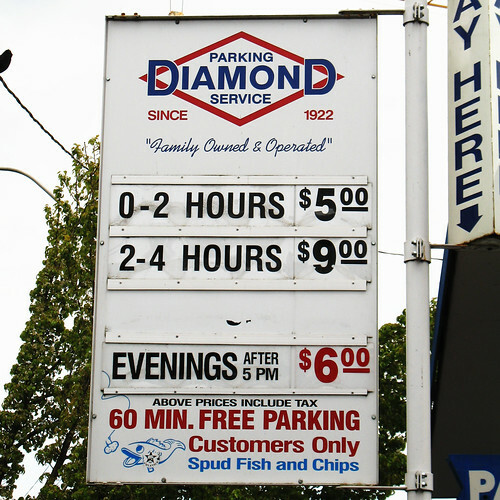 I seriously doubt that Diamond Parking is jeopardizing their business by operating unlicensed lots. There are entities like the Boys & Girls Club that might be, however. I’ll have to side with the City on this one. Parking lots have a major effect on traffic patterns and long term parking in particular exacerbates rush hour congestion. The other reason is that the City includes parking minimums on all businesses for good reason. If a business doesn’t provide adequate spaces for cars that it attracts during business hours that spills over to on street neighborhood parking and “circling the block” congestion. Selling off spots for long term parking circumvents the established parking minimums required by law. The UW has proven over the last 10-20 years that key to trip reduction is a limit on parking. The City may need to amend it’s codes, provide better bus connections to Link or take other measures but just blanked allowing long term parking along MLK near the stations defeats the purpose of the system and creates many negative impacts on the neighborhoods within walking distance of the stations. Selling long-term parking might circumvent established parking minimums required by law for operating businesses, but how much parking is legally required for a derelict store building? This is an existing parking lot, currently not serving any business. Presumably, the business owners could fence off the building itself and allow people to park for free in the parking lot, is it so much worse to charge a little bit for the parking until the building finds a new tenant? This is not the same as tearing down an existing building for a new parking lot. It sounds like the city code is taking a meat-ax approach to a surgical issue. The RVP comment says the lot has gone to 4-hour maximum parking, but I have to wonder how vigorously they will be enforcing the maximum. Are they really going to ticket and impound, or are they charging a full-day price for a four-hour space with a wink and a nod? Is the city doing anything to help the property owners develop commercially viable high density neighborhoods around these stations? In Chicago, the city provides funding for store-front upgrades and pedestrian improvements. The neighborhood business centers flourish and people congregate. Ridership is high. I live a couple of blocks from the Beacon Hill station. ST left empty fenced-in gravel lots after knocking down an existing business and houses for the development of the station (they leased it from private owners). Where is the planning and funding to now develop this land into something that will draw people to take the train to Beacon Hill? Non-existent. ST and the city will punish the landowners if they try to use the land for all day parking, but they haven’t raised a finger to help provide the skill and seed money necessary for the high density development they claim that they want. I hope that the McGinn administration does a better job of supporting urban development than the last administration did. They built a train to essentially nowhere and somehow expected development around the stations to magically take care of itself. Yes, the city does a lot of things to help high density, you should go over to the City’s site and look around. Right, they have a lot of nice words on the website, but have you actually tried to work with the city departments to implement some of these things? Having words on paper or on a website doesn’t build anything if these are just being used to cover inaction. I know all about the “programs” and I’ve been involved in working on station area planning, pedestrian/bike improvements, and the festival street on Lander next to the station. I have the intestinal fortitude for dealing with this stuff as do a small group of my neighbors. If I was a small business owner, I doubt that I would be able to do so. Nickels and his administration tried to kill neighborhood planning and involvement by making everything as difficult as possible. It was much easier under Paul Schell when we did planning for the Urban Village. The first thing that Nickels did when he got into office was to get rid of Jim Diers and cut the department of neighborhoods liaisons by half. I hope McGinn can get this back on track so we can actually get some development going and improve. Mira, you asked “Is the city doing anything”. It sounds like you were just asking that so that I’d respond, and you could go into a tirade. That was a rhetorical part of a larger post stating that I don’t believe that enough has been done. I didn’t expect you to respond. Re: the fenced lots, I wish those didn’t have fences. What’s the worst that could happen? Himalayan blackberries? Actually, in Lakewood, the lots ended up with abandoned cars and furniture. It cost Sound Transit a lot to clean up, if I recall correctly. Yeah I though the fenced lots were bizarre too, are they waiting for a developer to purchase them? As I mentioned in the other comment, no one seems to know for sure what the owners are waiting for, but since the area around the station is probably about to be upzoned, I would guess they are waiting for the upzoning and increased value. Leaving the fences also prevents them from having to deal with squatters or other liability. If someone trips and falls on their lot and sues them, that can be a big deal. Mira, from what I’ve heard (and, admittedly, this was a couple of months ago so things could have changed) the families who own those lots have not been particularly welcoming to attempts from the city to reach out to them and discuss planning. It’s their property, after all — once they have control of it back from ST, they don’t have to do anything with it until they want to, I guess. Also, since rezoning is in the works, it would seem to be in their best interest to wait for the rezoning before developing or selling the property, since it’s likely to be upzoned and therefore more valuable. You can’t really blame them for waiting. I would probably do the same thing. Yes, there are 2 property owners at the former ST construction site. One wants to work with Sound Transit and their neighbors to come up with a redevelopment plan, and the other one, with the property controlled by multiple familymembers, does not. Maybe, as Wendi suggests, things will change after the property is rezoned (probably to a 65-foot height limit). Oh, good — it sounds like you have newer info than I do. One property owner is willing to work with the community? That’s great. I wonder what the other group is thinking about doing. That’s right, most of the property is owned by a family that’s not interested in doing anything with it. They had an existing business and a couple of houses on the property until the station came along. The family member who represents them, throws out the letters that ST sends him and won’t talk to them. They are not waiting for a zoning change to start development. They apparently don’t need nor want the money. I doubt that they would even open a parking lot on the site. They just don’t want to deal with the city or ST. ST could have used eminent domain to acquire the property and then have sold it off after the station was completed. Instead they forced the family to lease it to them. Now the lease is ending and the property remains in limbo. That is the property owners right, but where does that leave the neighborhood? There should have been a plan to deal with this situation and all the other properties and businesses along the route. Support for those who are cooperative and stick for those who aren’t. There was a blind faith in “build it and they will come” development. Well that’s just not working out that well. Hope McGinn does a better job at making sure that ST doesn’t leave messes like this in the wake of building out the rest of the system. I like the station on Beacon Hill and now that the train is running, I will support build out of the rest of the system. But, I will not sing praises to the bureaucracy of ST and the city just for building the train. They need to be accountable for more than just that given the major impact it has on neighborhoods. It has to work better than that. I would hope that this blog did more to help keep ST accountable and to learn from the mistakes that have been made so that they are not repeated as the rest of the system is built out. Praise for the things that are working well and constructive criticism for what doesn’t. Why is that so hard? Uh… wow. Isn’t it just a bit early to call the game? I mean the captains haven’t even made it off the field from the coin toss. They are going to have to start paying taxes on the property again pretty soon. You would think that would be at least a little incentive. They’re going to have to raise those taxes pretty high. There’s at least one house on just about every block on Beacon Hill that’s been empty for years. They’ve been “in the family” for decades, are paid off, and the taxes are paid. The family won’t sell them, rent them, do anything with them. They just keep paying the taxes and keep the utilities on. I’ve lived next to one and just about everyone I know who lives on Beacon Hill has as well. The same dynamic is going on with the lots next to the station. They are likely to be empty for decades. There’s a cultural thing going on that ST planners just didn’t understand or take into account. There’s a cultural thing going on that ST planners just didn’t understand or take into account. This wouldn’t happen to be similar to the cultural thing that kept many International District properties vacant and/or in dilapidated condition for decades? If that is the case could the same things that were done to encourage renovation and redevelopment of ID properties be used with properties like the Beacon Hill station site? Mind you I don’t know exactly what happened in the ID to finally see a bunch of properties either fixed up or redeveloped in a rather short period of time, but I suspect the PDA might have had something to do with it. Mira, I’d love to talk to you more about the Beacon Hill lot, and even talk about changes Sound Transit has made to their policies in response to issues like that, but I don’t feel like you’re even opening to listening. You seem to have made your decisions about who’s wrong and why, and that won’t really lead you (or them) toward any positive change. I’m quite open to having a conversation. I just haven’t seen much other than ST boosterism on this blog. Email me if you’re serious. I could not agree with you more on this issue. Kudos for challenging the blind ‘anti-car’ agenda. This policy is unimaginably foolish. In fact, short of not building any transit anywhere at all, I can hardly think of a policy more hostile to transit ridership and light rail than banning private park-and-rides near stations. If in the past I have been critical of this blog’s blind allegiance to a narrow ideology, this post provides a compelling refutation of that criticism. On an issue like this, your long pro-light-rail track record adds tremendous weight to your argument. A pro-park-and-ride stance by Kemper Freeman would be dismissed as insincere (and it would be insincere) but no one can accuse this blog of being anti-transit. Your support for private park-and-rides is compelling evidence that in fact park-and-rides are good for transit, not bad. Thank you all for taking this stand publicly. The City’s insane policy is a textbook example of the perfect being the enemy of the good. Proponents imagine that if they simply ban the park-and-rides then people will do the perfect thing and walk, bike or ride a feeder bus to the transit station. This is not the case. In reality, most park-and-riders if pushed out of park-and-rides will drive all the way to their final destination and park there. If they park at a park-and-ride, 90% of their trip is via transit, that means 90% reduction in congestion, VMT, GHG emissions etc. Even if 9 out of 10 park-and-riders choose the perfect solution and walk to the transit station under the new policy, that one person in 10 who makes the full trip outweighs all of the congestion, VMT, and GHG emission benefits of the other 9, and the portion of park-and-riders who will drive is far more than 1 in 10. With respect to misusing land for parking, remember every person who park-and-rides rather than driving may increase demand for parking by one at say the rainier beach station, but in doing so they also reduce the demand for parking by one in downtown. Now, what makes more sense, a policy that encourages parking at the outlying light rail stations, or a policy that encourages parking in downtown Seattle? Which policy is more wasteful of land and more hostile to the goal of making seattle a great place for pedestrians? The answer should be pretty obvious. Finally, and I would argue most importantly, only a very, very tiny percentage of the region’s voters live within walking distance of light rail, but 70% of them will live within a short drive (2.5 mile radius). Banning park-and-rides essentially makes light rail an exclusive system: only the privileged minority who live within walking distance can use the system, everyone else, thanks for your money but we don’t want you using the system. If the public starts to feel that they are paying for a system that they can never use because they cannot access it conveniently, the public, even in Seattle, will lose enthusiasm for light rail. The concern about demolishing old buildings is valid, but as Ben points out, the solution is to ban the demolition of buildings for parking lots, not to ban the use of existing parking lots for the purpose giving more people access to light rail. Frankly, it even makes sense to allow park-and-rides on Capitol Hill. It certainly makes sense to allow them in the Rainier Valley. As for the TOD tradeoff, there is no tradeoff. Park-and-rides do not hinder TOD, they encourage it. Private park-and-rides do double duty, serving also as spillover parking for residents and retail businesses. This allows developers to build new TOD with less parking because the park-and-ride creates a safety net. In the absence of such a safety net, the developer will rationally overbuild the parking. While it is expensive to have more parking than you need, it is much, much more expensive to have to little parking and then not be able to rent your units. Thus, the risk is too high and developers will overbuild unless the have a safety valve. Park-and-rides also bring activity to the station area. Rather than just driving on through as they would otherwise, motorists using the park-and-ride need to stop their cars and get out and walk to the light rail. In doing so, they become much more likely to patronize the local retail businesses on their way to or from the station since they’ve already stopped and parked. Initially at a TOD the population density is too low to support retail businesses solely with foot traffic. The activity generated by park-and-rides helps keep retail businesses afloat while the density is being built, and that kind of pedestrian oriented retail, initially supported by park-and-riders is exactly what is needed to attract the density in the first place. The parking lots also mitigate the inadequate east-west bus service in Rainier Valley. When there are buses running every ten minutes to Seward Park, then you can argue that parking lots are no benefit. Are there plans on the drawing board to deal with the numerous fenced in gravel lots that litter MKL? They serve no purpose and many of them are located in what I would think are deal development areas. I believe that ST is looking to dispose of those to developers. But no one can get any credit right now. Ha ha! Developers? Many of those lots are super weird shapes, especially a few that are like 15′ wide between houses and MLK Way. The ones that are not usable should be made in to parks or plazas or something. They’re such an eyesore right now. 15′ wide is plenty of space for a coffee shop or a small take-out restaurant. I think that they are giving the properties back to the original owners, who may sell them to developers, hopefully. The city could certainly allow temporary use permits for lots like the Grocery Outlet. They have a defined time and when the property is no longer appropriate, you don’t renew the permit. This allows a temporary use without affecting underlying zoning against park and rides. The city does do this. Look at 2nd and Stewart’s permit. Well, I guess none of you are getting “recovered memories” of parking lot abuse when you look at the picture of a Joe Diamond sign. I remember dining at the Camlin in the early 70s and, looking out, it seemed that about 80% of the land was parking lots. Remembering those days of abuse makes me a lot more likely to wait and hear the city’s side of the story here. The funny part here relates to some posts at hugeasscity a year or so ago, where they pointed out that development done today will not be at the high-intensity level you wish to see in TOD neighborhoods along the Link. This basically relates to the current linear arterial-related zoning, contrasted to the desired shape of walk-sheds for transit stops. There are some good ideas in the comments, and they’d be even better if they were bundled and accepted by developers, the city, and transit neighbors. I remember hearing Jan Drago at a city council candidates’ forum basically saying how great the kind of zoning we have now is, and how we should have more of it – basically that we’d get 6-story apartment buildings along the main arterials, 3 story condos and townhouses a block behind that, then single family homes. She was all, too poor to live on a residential street? Sorry, you get the arterial. TOD walksheds will, eventually, unstraighten this all out. If people do “get the arterial”, then when we try putting those roads on diets, we get a lot more support. Sounds like the issue at hand is simply what’s allowed by the zoning. DPD doesn’t make the laws. C’mon, DPD may not “make” the laws, but when it comes to zoning, it sure as Hell writes the laws, the draft that goes to City Council for approval. And given the complexity of zoning law, getting City Council to overrule technical code language written by “experts” is, well, near impossible. What I mean is that the council or someone said “No park and rides in the station areas” and DPD translated the law into the technical language of actual city code. If the original law said or meant “no publicly funded park and rides”, it may be that only a clarification of the legislative intent is needed. The city of Tacoma went after the private parking lots a different way – they beat them at their own game. The city built two large parking structures near the T-dome and put light rail in linking them to downtown. The parking and rail fare are free. Free! Now there’s little incentive for Diamond parking to buy every available building and turn it into a parking lot like they did in Seattle. That was ST, not the City of Tacoma. I too am with the City on this one – I hate these haphazard expensive to park lots anyway. They are poorly maintained with no landscaping – just overblown weed strewn lots “we paved over paradise and put up a parking lot” – Actually too many lots are not even paved in Seattle but just gravelled with walls scrawled with graffiti and litter – we can do and have to do better than this. This reminds me of what I heard happened a while back–a private company offered to operate the Eastgate P&R at no cost to the city, and to provide security there as well, but it was nixed down. I live near a Light Rail station but the present amenities do not entice my friends to visit me and stay awhile. Why? The light rail stop has a pawn exchange and shucks auto parts place, so for now I take the light rail to dwtn to play. Trust me, the current “shops” at 90% of the light rail stations do not entice people to visit Se Seattle. Well this is a whole other issue, but yes, I agree with you that there is need for much urban renewal down that corridor, but hopefully, Link will inspire just that. It did in Tacoma. Tacoma has done well given the hand it was dealt. But Tacoma Link didn’t keep Russell from moving to Seattle. Free parking and a shuttle only gets you so much; probably less than it costs to build and operate. But the parking garage will be in higher demand with those Russell employees taking the train to Seattle. Well that is another issue again. We are moving in this discussion from random car lots with no aesthetic strength and community to them to squalid strip malls around stations to the inability of Tacoma Link to stop Russell moving to Seattle. I don’t think that Link can be expected to resolve all of these issues. My main concern is getting more attractive amd netter maintained businesses and housing into the corridor it serves. Tacoma Link did a great job inspiring less profit-minded enterprises – the Convention Center, the Museums, the Universities to stay put and/or inspire building renovation work. There are signs of TOD around the Rainier Valley Link stops but obviously more will need to be done. Ill-maintained parking lots are not the answer and the strip malls need makeovers, but the line has only been open for six months so we need to give these things time and try to identify what is helpful and what isn’t. Actually I find myself at the Othello Station quite a bit, but then Tammy Bakery and Tacos Al Aserdo are a pretty powerful draw. I should probably explore the areas around Beacon, Mt. Baker, Columbia City, and Rainier Beach more. So far I haven’t found anything with as much pull for me as those two restaurants at Othello. Columbia City has lots of great restaurants. On opening weekend we took Link down there to get brunch at Geraldine’s Counter, and there’s a great barbeque place. There’s also the Columbia City Theater, a nice old (and cheap) movie theater. If we lived down there, the Viet-Wah on Graham St would be another big draw. On Beacon Hill, you might like El Quetzal (a few blocks south of the station on Beacon. It’s true there’s not a ton of stuff up here yet, but some of the restaurants are very good. Rumor has it that there might actually be events to attend up here sometime in the future… people are working on some plans and ideas. May the density skyrocket around Mt. Baker station! I use link to get downtown once or twice a week or so in the midst of errands around east & south Seattle. I often need to be downtown for 3-4 hours, so I don’t use on-street parking. I actually patronize the shops around the station like never before *because* there’s parking AND light rail. I use them *after* I park and get on the Link, and after I get off *before* I head home. I can’t take the bus to the station (as the City wants) because my stop ends 1 mile away from the station. Metro refuses to extend it because it already has low ridership. I drive to Link because it’s quicker than waiting a half hour for a bus that’s a slow, horrible ride downtown. Loud, uncomfortable,and frequently unreliable. If the City (and Metro) wants to make it impossible for me to use link because I don’t live right next to it, okay. But taking away my options isn’t going to get me out of my car. It’s going to keep me in it. Sounds like the system is working perfectly. Your comments about a route stopping a mile short of Link sounds like exactly the sort of thing that needs to be fixed instead of creating a parking problem. Let’s see, ridership is low because we end the route a mile short of where everyone whats to go… should we extend the route or just add parking? I wrote to Metro. No reply. I wrote to my King County rep. I got a curt reply that said they’d looked into extending the route, but it would cost too much money. Even if that bus were extended, it only runs every 1/2 hour, and it can be unreliable. So I don’t use it. I just gave up my U-Pass because it was too expensive and my salary has decreased in real terms and I had to cut my budget. So I stay in my car. I’m exactly the kind of white, upper-class, guppie that you are trying to get out of his car. Is that the system working perfectly? Your ceteris paribus arguments just aren’t convincing. You’re making crucial factors exogenous to your model. I’m arguing they’re not. One of the major parts of planning the Tri-Met MAX system in Portland was coordinating the projects with local zoning to ensure that there was dense/appropriate growth along the route. There were transit-friendly projects, housing that you can walk to, and so on. Perhaps I wasn’t paying attention early on, but was this part of the process for siting the Link lines? Link was sold as transportation. MAX was sold as transportation AND urban development. What is missing here? Bryan – the first MAX line didn’t really do this. Then developers caught on and started *wanting* to be involved for future projects. ST had the same scenario. Developers weren’t interested. Now they’re starting to be. The fact that several of the projects along the Link alignment are moving forward when many other projects elsewhere in town have stalled I think speaks to the potential boom we’ll see when the credit and real estate markets recover. Othello Partners are forging ahead with some new mixed-use development near Othello Station despite the recession. In regards to Portland, forgive me if I’m wrong, but it seems like the Portland Streetcar has spurred more development than MAX has. Most of the MAX stations seem to be located in the freeway median, which doesn’t seem like a prime location for catalyzing transit-oriented development. Othello Partners are forging ahead with some new mixed-use development near Othello Station despite the recession. They’re currently building around 700 new apartments with around 40,000 square feet of retail. There are also several smaller projects near the Mt. Baker Station that are going forward, and the ongoing redevelopment of Rainier Vista. The whole point of Light Rail is to have increased density within walking distance of the light rail stations. I don’t know what this has to do with Crime Prevention, either. There is also a logo at the bottom of the page that says “HANDS OFF My Home” with an ominous hand rising threateningly over a house. Pat Murakami’s name and email are on the bottom. Though they didn’t mention transit or TOD in this flyer, this is a group that has spoken out pretty strongly against TOD in the past. Not just TOD, but increased density, and transit as well. As best as I can tell Pat Murakami and her friends don’t want anything new built in SE Seattle unless it is single family on a vacant lot with suburban parking requirements. Murakami was also involved with the “Save Our Valley” group who sued Sound Transit to try to prevent Link from being built in SE Seattle. While I’m always a bit uncomfortable with the use of eminent domain and especially so for economic redevelopment purposes I can see the use of it. For example if the property owners around the Link stations who’s property was used for construction staging continue to refuse to do anything with it I can see the merit of taking the property and selling it to someone who wants to develop it for the good of the community. The flyer we received from Murakami’s group is definitely presenting it from a lefty-friendly social justice perspective — “the Community Renewal Law is being used to target the poor neighborhoods of King County! We must protest!” But the problem is, I don’t believe that is the ultimate intent of this group. It is a fundamentally anti-density, anti-urbanism, anti-change group, but they will draw in a lot of people by cloaking the issue in social justice terms. I am struck by many of the commentator’s utopian visions of transit oriented development that seem skewed to “if given a few years, this idea will work.” My guess is it is going to take a lot long than even a few years for the over development that occurred in Seattle to settle out. In other words, we are overly supplied with new housing units and under supplied with folks to occupy them. Think downtown, for example. And then there is the pesky thing called reality. The reality is many many people do not live lives scheduled in high density terms but want to use transit as much as possible. You know, the folks who are willing to pair down their consumption (a good thing, right? ), live in smaller spaces, perhaps high density, even with kids. But their kids want to take music lessons, play after-school sports, and they also take care of an elderly parent who happens to live in West Seattle. So they buy a small condo near the light rail, but also may need to park close to the station so they can get off, get to the kid’s soccer game, rush over to West Seattle to check on the parent, and be home before midnight. Should we not, as a society, try to make sure we have a diversity of people in our communities. People with children, elders, active schedules that might take them hither and yon? BART, METRO (DC), the NY train systems into Westchester, Long Island, and Connecticut, are successful in terms of ridership numbers because the accommodate people’s real lives not an urban planner’s ideal. Last, it seems in a recession where we are trying to help everyone earn an income, isn’t it a bit ridiculous to shut down this parking lot where some guy is making a few bucks? The problem is the unrealistic prices of these units. Would-be residents can’t afford them, don’t want to pay twice what they’re worth, and don’t want to take a big loss when they sell them later after the wages-to-price ratio has returned to historical levels. If the developers lower their prices to $100-150K, the units would be filled. Listing prices and selling prices are two different things. Look at sale prices for those condos that you think are “overpriced.” My guess is the downtown and matter of fact, all urban density developers are either selling those units for substantially less than list price or are merely converting to rentals until, they hope, the market changes. Perfect example is SLU. Another are the large developments in Ballard. All are going rental when they were developed as condo. And they all have substantial vacancy rates. Nope, there is a huge glut in the high density market in this city. We’re supposed to be moving toward a more liveable environment, which means getting people out of their cars. We need to be getting out of the parking lot business, not setting up new ones. We should not be setting up a system for people to drive alone in their cars to transit. Ridiculous in this day and age! Let’s focus instead on improving the ways for people to get to transit via walking, biking or bus. Why would driving alone be any worse than being dropped off at a “kiss & ride”? Driving alone has half the carbon footprint of being picked up and dropped off. Besides, there are plenty of transit passengers who live alone, and a good chunk of them are not able-bodied to walk or bike to the station, and don’t have a decent bus line available when they need it. We’re hearing a healthy dose of stories from people who would ride if they could. This is a wonderful problem to have. How can we get a cease and desist for the diamond lot in Columbia City? Martin, you know as well as I that the city has parking regulations for development and its bound in the biding site plans. The zoning dictates this and it is illegal to use those parking spaces for anything other than that for uses which they serve. As a planning intern, I was forced to go out to a complaint because a business was using additional parking spaces than it was allowed to use for its activities and on a site where numerous businesses shared the parking spaces. This cuased a significant problem at certain hours of the day. There is a reason why parking regulations exist. Having said that, I also champion the reduction and restriction of parking in development, particularly on-site parking. I think if the city wants to review its parking standards and zoning regulations for this area, they should. But, until this has been carried out, it is and should be illegal for anyone to let out space for parking on their site in fairness to the neighbourhood and the surrounding businesses, as well as the regulatory laws in place. What you are asking is the city shurk their duties to the laws that they have established. That’s NOT what should happen or people will start asking the city shurk other regulatory laws (not that they don’t already try). Again, a formal change of regulations is what must happen and perhaps it’s warranted here. Danny Westneat wrote about this issue today. In city neighborhoods, of course I’d rather see people use transit to get to transit. Would also rather see vacant land used for parks than parking-lots. City has plenty of authority to make clear that today’s parking will become tomorrow’s park- as soon as that’s seriously ready to happen. Right now, current wasteland along MLK is positively bad for both desirable development and LINK. Think of it as introductory marketing- people parking there now will develop the twin habits of riding light rail and going to Seattle, including the Valley. Habits that will also bring them onto transit as soon as we’ve got transit they can use. As befits a new industry fighting for its life, transit hasn’t got the luxury of annoying either potential passengers or local small businesspeople without a powerful and immediate reason. Dory Monson’s already got enough material. a couple things. The Grocery Outlet building and the parking lot (a separate parcel) are both owned by the Univ of Wash. Additionally, the amount of income generated by any of these lots is/would be, small. For instance, the Grocery Outlet lot might have 100 spaces? Assuming that all 100 are monthly renters @ $30/month, well, that is peanuts. It wouldn’t even pay the taxes on the lot (not that the UW pays taxes) nor upkeep/security etc. A simple solution is to allow only currently existing lots/spaces operate as pay lots and as one previous commenter said, put a sunset date on the permit and review before renewal. McGinn should be all over this – whatever it takes to get more people on the train. The number of riders is shrinking and this would boost the ridership. Actually when a private party is allowed to use public property for private use there is something called the “leasehold excise tax” which replaces the property tax. Now determining what that tax should be is a rather arcane and specialized area of state law and tax policy. How about this for a solution. I’m guessing that the main reason that anyone would use the Rainier Avenue/Othello etc. faux “park and rides” is to avoid the cost of parking downtown. Have the city allow parking at these outer lots, but only if they charge a rate consistent with the average rate in the downtown core? Jeff, that makes perfect sense. There would be zero incentive then for someone to get out of their car south of the city to ride transit since the cost won’t be a motivating factor. Folks are willing to give up a portion of the car commute for fiscal reward. They aren’t going to get on your bus to make the trip to a link station – mostly because there aren’t enough buses serving the outlying neighborhoods with frequency and/or schedule reliability. Your idea also creates zero incentive to get on the light rail at any stop. It’s cost equivalent to just park downtown. The perfect is the enemy of the good. Looks like McGinn is taking the reasonable route on this one. Unexpected and welcome.